When you really loved a class and want to do it again... now you can! A new class will be released every Tuesday at 10:00 a.m. Pacific time. Episodes are provided free of charge, but we would love if you would visit our Patreon page and pledge an amount to support the podcast! 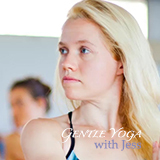 This is a video of Jess doing the yoga class. For this class you will need your mat, a yoga block is optional, and a chair. Your browser doesn't support video streaming. This class focuses on fascial stretching for the low back, hip openers and the use of pranayama to deepen your meditative state. You will need a block and your yoga mat for this class. Your browser doesn't support audio streaming. In this playful class we focus on lubricating and finding full range of motion for the joints, chi cultivation and hip openers. A block is optional for this class. You will need a chair for this class. You will need a yoga block and a blanket for this class. You will need an extra rolled up yoga mat, or folded blanket and a yoga block for this class. A yoga block is optional for this class. You will need a yoga block and a blanket. You will need a strap, and a blanket is optional. You will need a yoga block and an extra blanket. For this class you will need a chair and an extra blanket. For this class you will need a rolled up blanket or an extra mat. For this class you will want an extra yoga mat or blanket, and a strap to help if your flexibility is limited. Today's class will include the use of a chair and optionally an extra yoga mat.